Dear Haze, you are straight up irritating. It’s time for us to have a heart-to-heart. I have a few things to literally get off my chest, not limited to your nasty little PM2.5 particles that I can feel invading my respiratory system. You know, when I first heard about you in June 2013, I wasn’t too fazed, Haze. You were no biggie. I was on a business trip in gorgeous Auckland, New Zealand, breathing in crisp, cool, fresh air. I was newly pregnant, but didn’t know it yet. My husband would tell me over the phone how bad it was and while I tried to sympathise, I thought everything was getting just a little too OTT. Come on guys. It’s a little pollution. We’ll get through it. Clearly, I underestimated just how bad you really are. Haze, you are straight up irritating. In every sense of the word. I do not appreciate the 2-month-long nasal tap you have bestowed upon my 19-month-old. We were getting to a good place sleep-wise, and you’re really messing things up for us. I miss wearing clothes sans the snot stains. The cost of tissues is going to bankrupt us. I am not a fan of the fact that you have kept us indoors for so long. Cabin fever has been redefined. Right now, The Bunny Hop song is on for the twenty-seventh time this morning. I do not want to hop like a bunny, jump like a joey or leap like a froggie, any. more. Sure, I know what you’re going to say: there are all those indoor playgrounds available for our patronage. But really though, Haze, haven’t you thought about the fact that you’re essentially forcing everyone into those soft-play cesspools of viruses? You like the fact that as a consequence, we don’t know whether that runny nose is your doing or a result of our child gnawing on something that Sally McSneezy had her hands on, don’t you? We’re onto you, Haze. We are onto you. You’ve really cramped my style. You’ve forced me to be convinced by that Wall Street Journal article last week and abandon my anti-screen-time policy. We started watching YouTube videos this week. I don’t know who I am anymore. You’ve made me question my identity as a mother. I was trying to be that mom, you know. The one that creates numerous sensory play ideas out of nothing to combat the indoor blues and wile away the time with ease. The one that bakes cookies with her 2.5-foot tall assistant and is not bothered by the greasy creamed butter and sugar smeared all over the floor, or the specks of salmonella hiding in bits of raw egg in said assistant’s tousled locks. My attempts at making coloured pasta for sorting into perfect little containers have only resulted in shards of dry penne embedded into my carpet thanks to the aforementioned 12-kg Hopping Bunny, punishing me several times a day for trying to be creative. My attempts at involving my toddler in the baking process has resulted in too many leftover shortbread cookies which I can’t help but eat because, you guessed it, we’re home. all. day. I am over the sneezing. No, really. I am over the sneezing. You’ve pushed me beyond the already limited bounds of my bladder control and it is not an empowering realisation. I thought I had more time. I thought we were okay in that department. Alas, your invasive little micro-particles are teaching me otherwise. Thanks for that. It’s not my fault, you’ll say, second pregnancies are a lot harder on the bladder. Whatever. You’re rubbing salt into the proverbial wound. Let me at least pretend that I have some semblance of dignity for just a couple more months. I genuinely don’t need you speeding up the process for me. I am annoyed that you have me repeatedly checking my phone on the hour. I’m starting to obsess over the hourly readings. I checked the readings at 3am the other day. I’ve started having conversations with my friends which go something like “well, yesterday when I left the house the website said it was 85, but so help me God, I’m telling you, it smelled more like 187“. What does that even mean? 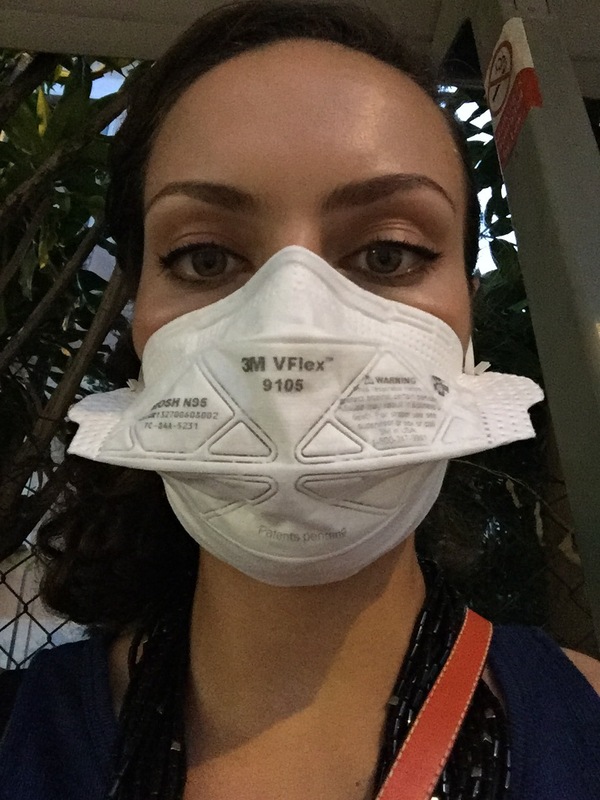 How is it that my nose is now a fairly reliable measure of air pollution levels? Haze, oh Haze. I tried to have a ladies’ night last night. I wore lipstick. I have worn lipstick twice in the past year. It was a big deal for me. But no, Haze. You decided that I couldn’t completely have that either. Instead, upon arriving indoors, I greeted my fellow ladies with a mist of sweat and smudged Revlon Strawberry Suede surrounding my mouth. It’s time for you to go, Haze. We’re done with you. Enough is enough. Never have we been more eager to go outside and play with our kids in over 35-degree heat and 90% humidity. I want to stand at the bus stop without trying to process algorithms in my head as to how many cigarettes we have effectively smoked due to the bus’ 2-minute delay. These masks we have to wear for you are not. cute. Haze, Haze, go away. You’re making us all go a little cray cray. It really is Claire! It’s scary that it’s gotten this bad already. Please breathe in that beautiful Kiwi air for me!